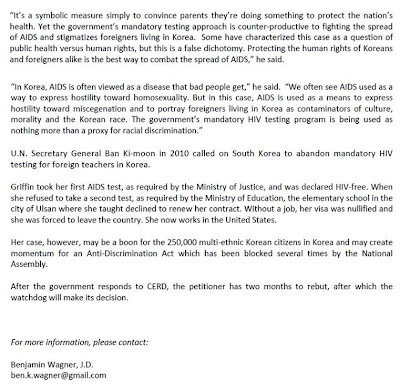 South Korea has been challenged by the United Nations (UN) under the International Convention on the Elimination of All Forms of Racial Discrimination in a case involving the country's compulsory repeat testing of foreign English teachers for AIDS. And according to South Korean citizen journalism website Ohmy News International not one mainstream news source in South Korea has reported this event. 1 Response to "Korea news blackout over country's racism charge"